To Honors instructor Rob Alley, a lot of life lessons emanate from art, and these lessons form the basis of UH 210, “Art for Life’s Sake.” This freshman seminar explores diverse expressions of art, including music, theater, and visual arts, but Alley is quick to explain that his class is not simply an art appreciation class. 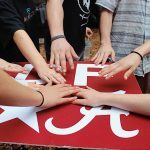 Instead, Alley describes it as an “art philosophy” class, which helps students utilize art to explore who they are and how they fit into the world. “My class is different,” Alley says, “because we take experience as text.” The experiences include those that students have with art in and outside of the classroom, combined with the student’s life experiences. Every student has something of value to bring to the class, whether they consider themselves to be artistic or not. They soon find out that all human beings are artists. It’s not a matter of if, it’s a matter of when and to what degree. 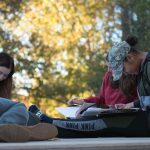 Students in Alley’s classes travel across campus and around central Alabama to experience art in many forms. One class might involve attending a concert while another is watching a dress rehearsal of Alabama Repertory Dance Theatre. The overall experience is enhanced by talking directly to many of the actors, choreographers, designers, and musicians involved in these productions. This is the point at which Alley’s class diverges from a more traditional art appreciation class. Art appreciation might encourage students to interpret what a work of art “means” by trying to understand what the artist intended to convey. Alley argues that asking what an artist meant is, to a large degree, asking the wrong question. “Everyone can relate to art,” Alley says. “The important thing about art is not that it gives us answers, but rather that it poses questions. And the most important question is what we each, individually get from the art, not what we are ‘supposed’ to get. Rob Alley is an accomplished trumpeter, composer, and jazz. His classes have ranged from Trumpet to Jazz Studies in the traditional realm, to Improvisation in Life through Music and Leadership Lessons Through Jazz, courses he currently teaches in the Honors College. 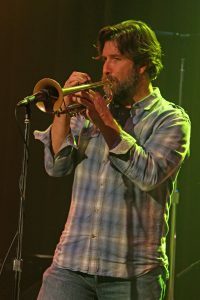 His class curricula develop from his own experiences as an artist and are informed by the experiences of other artists, such as Dave Douglas, Bill Frisell, Herbie Hancock, Miles Davis, and Wynton Marsalis. “What I teach is that life is volatile,” Alley says, “and we have to be comfortable that life is a struggle.” Many people perceive “struggle” to be a negative word, but not Alley. Instead, he sees lessons in adaptation and resilience that come from overcoming challenges. “I tell students to embrace the struggle,” he says. Asked what he expects his first year students to get from his classes, Alley pauses and then answers thoughtfully. At the end of the semester, he says he hopes that they have discovered things about themselves, perhaps more than they would have anticipated they could. This process of discovery comes not just from his students’ experience with the art that they experience, but from their teacher, who is there at every step to challenge, question, and help his students grow by learning to ask their own right questions. 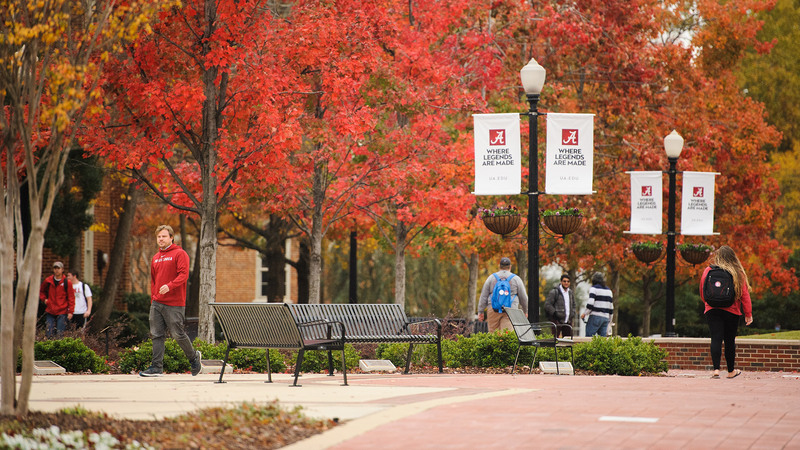 View some of the courses Honors College offers! Scientific evolution and revolution from ancient to modern times, philosophy behind science and engineering, the nature of reality based on scientific empirical evidence, objective evidence for and against a superior rationality behind the evolution of the universe as well as scientific discovery and achievement.